Born in West Germany in the midst of the Second World War, Ulrike (Uli) was the sixth of ten children. She left Europe at age 23 to come to Canada. Uli has enjoyed a very interesting life and speaks several languages fluently. Uli is proud of her 3 grown children and maintains regular contact with them. A brain aneurysm left her with no short term memory and she now lives in a group home in Edmonton, Alberta. She loves coming to the studio because of the incredible amount of materials available to her. Always interested in art, she once had her own loom and taught weaving. Uli typically works in ink and oil pastels creating drawings that are rich in colour with playful designs often resembling ivy and flowers. Often surprised at her own work she considers her drawings abstractions of her mood that day. Her colourful creations are metaphors for the seasons and nature. For Uli, the colour green represents life. 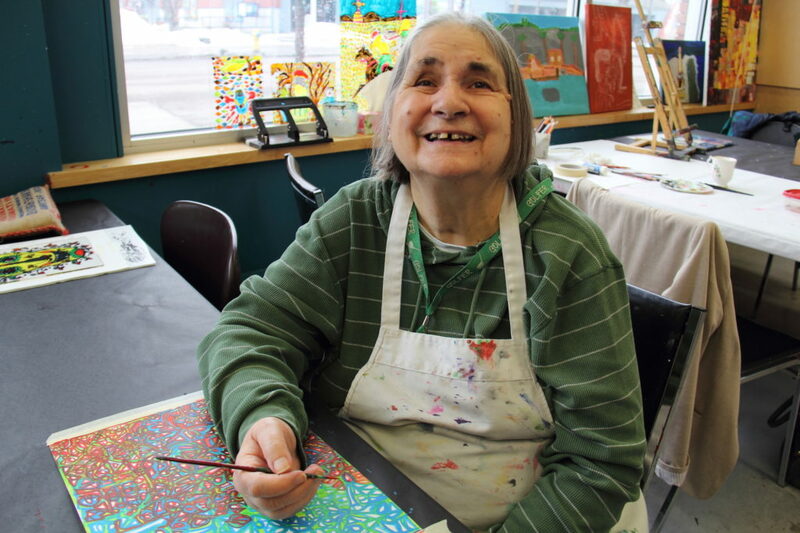 Uli is a prolific painter and describes herself as tough and a survivor who never gives up. Uli may not be able to remember the piece she was working on, but she can always recognize it as her own.